The pregnancy of Japanese Princess Kiko is proceeding "smoothly" despite complications, palace officials said Thursday following a medical examination. Kiko, 39, is due to give birth in late September, but her doctors said last week she has symptoms of partial placenta previa, a condition in which part of the placenta drops too low in the uterus, and may have to give birth to her third child by Caesarean section. During a medical examination Thursday, the first since the July 18 announcement of the problem, doctors said both Kiko and her fetus are "stable," said Imperial Household Agency spokesman Yasuo Moriyama. Kiko has been resting since the problems were found. Although she still has the placenta problem, "everything else is going smoothly," Moriyama said. "No other immediate problems have been found." Palace doctors have said the baby may come earlier than expected. The pregnancy of the wife of Prince Akishino, who is the second son of Emperor Akihito, has won national attention because the Imperial family has failed to produce a male heir to the throne since 1965. The current law allows only males to reign. Kiko and Akishino have two daughters. 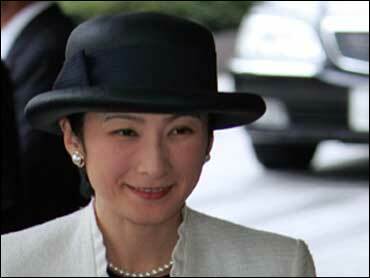 Akishino's older brother, Crown Prince Naruhito, and his wife, Masako, have one daughter. Prime Minister Junichiro Koizumi last year pushed for legislation that would allow a woman to take the Imperial throne as a way to resolve the succession crisis. But Kiko's pregnancy raised hopes for a male heir and took the steam out of Koizumi's drive.